Traditional European Pain Au Levain bread made by the French process of triple fermentation that creates a subtle combination of wheat and sourdough flavor. Contains: wheat flour, sea salt and spring water. 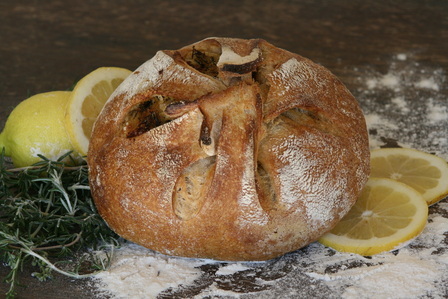 Mildly tart sourdough sprinkled with sea salt and enhanced with fresh rosemary and lemon zest. Best when paired with Italian olive oil and balsamic vinegar. A true Mediterranean classic. 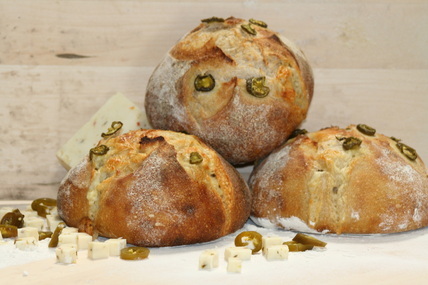 A flavorful sourdough studded with imported Kalamata olives and crowned with a dash of sea salt. Sweetly satisfying. Perfect when toasted for breakfast with a dab of butter. A wholesome combination of oats, flax seed, millet, whole wheat, cornmeal and a touch of honey. A great source of fiber! 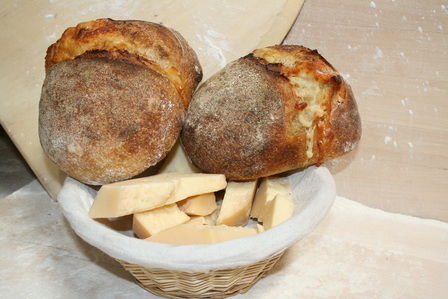 Considered an aromatic meal in a loaf, the sharpness of Asiago combined with sourdough entices the senses and satisfies the appetite. 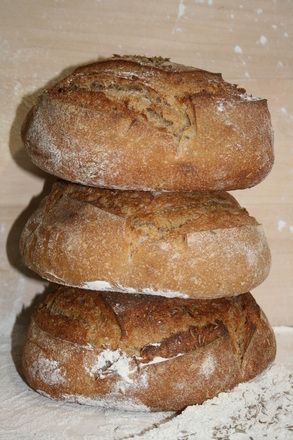 Our flavor-filled medium rye has a deep richness reminiscent of the old world European bakery. Baked only on Fridays. Motivation to get out of bed in the morning. With the biggest, juiciest Crimson raisins we could find, whole wheat Cinnamon Raisin toasted with a dab of butter, as sumptuous French toast, or fancying up a PB&J will become a fast family favorite. Feeling spicy?? We've got the flavor for you! Jalapeno Jack may begin mildly at first bite...give it a minute and you'll feel the kick. Italian Herbs joined together with sun-dried tomatoes...Delicious! Baked Tuesday and Wednesday.